On a beautiful east coast day on New Zealand's south island with the camera ready for pictures of whales, I caught a brief glimpse of the hump of this classical whale as it dove gracefully to the ocean floor. In these pictures of whales you can see the distinctive hump followed by a series of lumps trailing down towards the tail flukes. This is the start of a series of pictures I shot on this whale. 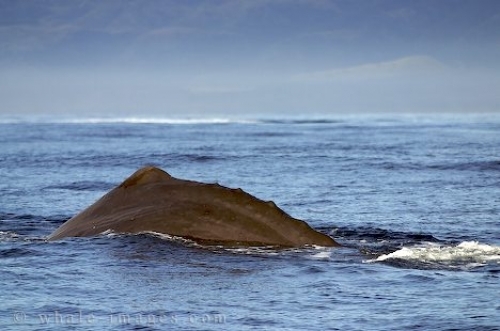 Picture of a Sperm Whale off the Kaikoura Coast on the Southern Island of New Zealand.